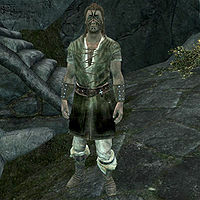 Eltrys is a Breton citizen who lives in Markarth. He was recently married to Rhiada and the couple awaits their first baby. After first entering the city, regardless of what happens to Margret, he will talk to you and hand you a note that will start The Forsworn Conspiracy. He wears a set of farm clothes with hide boots and bracers. He carries the key to his room in the Warrens along with an iron dagger and a selection of common items and gold. Note that a different version of Eltrys will appear at the conclusion of the related quest; see notes section for details. When you first arrive in Markarth, Eltrys will be positioned just outside the Silver-Blood Inn, within good viewing distance of the market. After you have witnessed the assault on market customer Margret and the demise of Weylin, he will actively seek you out and ask: "Gods. A woman attacked right on the streets. Are you all right? Did you see what happened?" You can tell him you missed the event completely and apologize, to which he will remark, "You don't have to say sorry to me. I just hope the Eight bring us more peace in the future." You can also say you witnessed the entire incident and your life was in danger: "I'm so sorry. I hope the Eight give you more peace in the future." Lastly, you can tell him that people were talking about the 'forsworn' during the fight, which will make him wonder, "The Forsworn? Strange. Well, I hope the Eight give you more peace in the future, for what it's worth." Regardless of your choice, he will suddenly say, "Oh, I think you dropped this. Some kind of note. Looks important." As it is obvious he plants the note on you, you can ask him if it is his note: "My note? No, that's yours. Must have fallen out of your pocket." You can also ask if he knows anything about the attack: "No. I was just getting some fresh air. Had one too many pints of mead at the Silver-Blood Inn." If you read the note right away, you can ask Eltrys how to find the Shrine of Talos and get his innocent act once again: "Huh. Not sure. I don't worship Talos, myself. I think I heard someone mention it was underneath the Temple of Dibella, in the big crag in the center of the city." Whether you follow the objective and read the note or not, Eltrys will head directly towards the Shrine of Talos and wait for you to come around. When you do, he will reveal himself as conspiratorial and quite paranoid, saying, "I'm sorry to drag you into Markarth's problems, but after that attack in the market, I'm running out of time." or "You're an outsider. You're dangerous-looking. You'll do." Ask him what he is talking about and his voice will reveal fear: "You want answers? Well so do I. So does everyone in this city. A man goes crazy in the market. Everyone knows he's a Forsworn agent. Guards do nothing. Nothing but clean up the mess." You can now reject his ramblings as nonsense; he will just say, "You want to walk away? Fine. But there's going to be no justice for that poor woman. No one to care what happened to her." If you choose to hear him out, he will elaborate: "This has been going on for years. And all I've been able to find is murder and blood. I need help. Please. You find out why that woman was attacked, who's behind Weylin and the Forsworn, and I'll pay you for any information you bring me." You've looked into these murders? "Yes. It all started when I was a boy. My father owned one of the mines. Rare for anyone who isn't a Nord. He was killed. Guards said it was just a madman, but everyone knew the murderer was a member of the Forsworn. I've been trying to find out why ever since. Gotten nowhere so far, and then I got married. Have a child of my own on the way. I swore I was going to just give up, for my child's sake, but it's like my father's ghost is haunting me. Asking me 'Why?'" "They're remnants of the old rulers of Markarth. Natives of the Reach. Followers of the old ways. The Nords drove them out of the city. Ulfric Stormcloak and his men. That was about 20 years ago. But somehow they're still here, and they're killing people." Who was Weylin? Where did he live? "He was one of the smelter workers. I used to have a job down there myself, casting silver ingots. I never knew much about Weylin, except he lives in the Warrens, like all the other workers." What do you know about Margret? "She's not from Markarth. The air about her screamed "outsider." Visitors to the city usually stay at the Silver-Blood Inn." After you have discovered Margret's true identity, you can return to Eltrys with the information that Margret was in fact sent by General Tullius to investigate Thonar Silver-Blood. This will net you a leveled reward and a comment: "So the clues point to the Treasury House, then. That makes sense. Thonar is involved in every facet of the city. Here's the gold I promised. Keep following the trail and there will be more in it for you." Additionally, when you inform him that Weylin was working for Nepos the Nose, he will send more gold your way and comment: "Nepos the Nose? He's been in Markarth forever. And he's well-respected among the natives of the Reach. Good work. Here's your gold. I have a feeling Nepos gets his own orders, though. If you find out, I'll have more for you." After the incident inside the Treasury House, or your encounter with Nepos the Nose, the plot thickens, although Eltrys will never find out what was really going on. 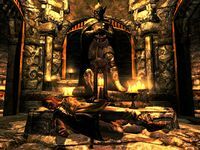 When you enter the Shrine of Talos you will find Eltrys dead on the floor, and three Markarth guards waiting for you. If you ask what they did to Eltrys, they will only comment: "Same thing we do with all the other natives who want to change things around here. We had a nice little deal going between Thonar and Madanach until you and Eltrys started snooping around. Well, you wanted to find the man responsible for those killings? You'll have plenty of time with the King in Rags when you're in Cidhna mine." The dead version of Eltrys is technically a different NPC called "EltrysDead" (Form ID 00101000, RefID 00101001). It has the same inventory and belongs to the same factions, but carries two leveled quest rewards in gold. If you leave the market before Eltrys speaks to you, he will follow a simple daily routine. From 7am to 7pm, he will work at the smelter. The rest of the time, he stays in the warrens. When he sees you, he will talk about the attack and ask if you saw what happened, as noted above, but you will have to actively speak to him to respond to what he says—the dialogue will not happen automatically. Eltrys's war paint is unavailable to the player. He shares the war paint with Bothela. This page was last modified on 27 December 2017, at 06:32.